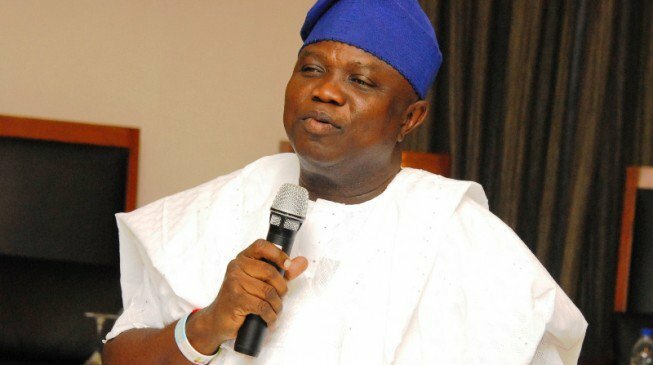 Governor of Edo State, Comrade Adams Oshiomhole on Wednesday commended his Lagos State counterpart, Mr. Akinwunmi Ambode for his various interventions in the last 18 months of his administration, saying that it has greatly impacted on the State, especially in the area of traffic reduction. 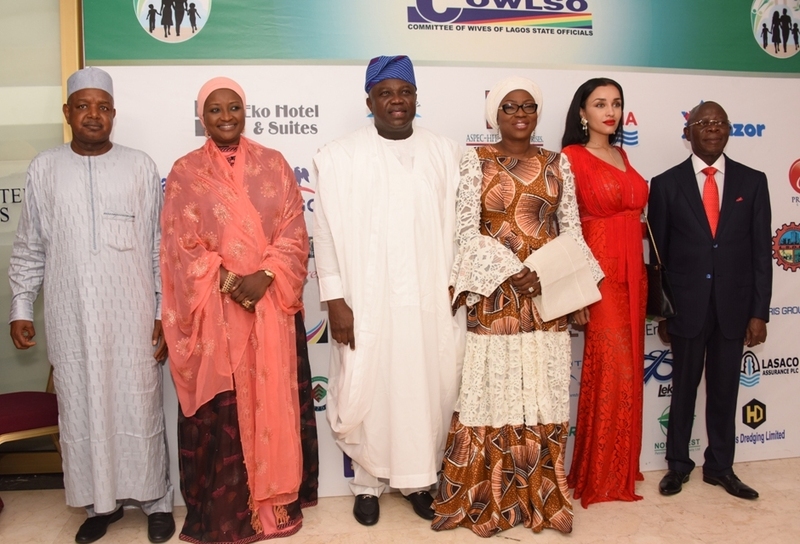 Oshiomhole, who spoke at the closing ceremony of the 16th National Women Conference, organised by the Committee of Wives of Lagos State Officials (COWLSO), commended the wife of the Governor of Lagos State, Mrs. Bolanle Ambode, particularly for sustaining COWLSO since its establishment, adding that the choice of the theme for this year’s Conference “Strong Family, Strong Nation’, was quite instructive. 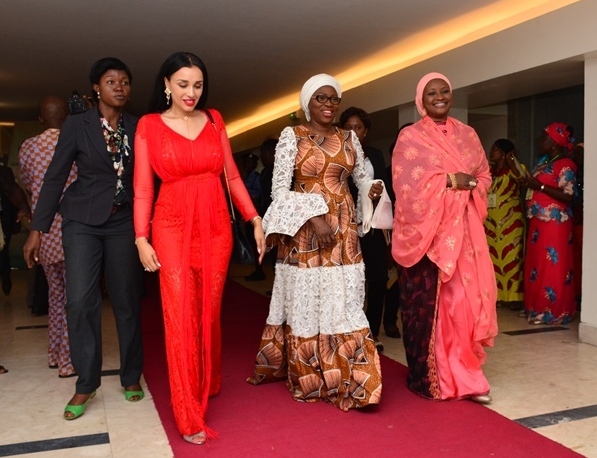 Wife of Lagos State Governor & Chairman, Committee of Wives of Lagos State Officials (COWLSO), Mrs. Bolanle Ambode (middle), with Mrs. Iara Oshiomhole (left) and Dr. Zainab Bagudu (right) during the closing ceremony of the 16th Annual National Women Conference organized by COWLSO, at the Convention Centre, Eko Hotel & Suites on Wednesday, October 26, 2016. Speaking on the specific challenges posed by modern lifestyle on the family where the parents would have to leave home early and come home late, Oshiomhole said Governor Ambode, with his strategic traffic management initiatives was to a very large extent addressing the challenges. Oshiomhole said, “As I was coming to this place today, I noticed something that I think is worth celebrating because of its impact in helping family unity and family union. Why will you wake up at 5am or 4am just to be at work at 8am devoting all the time to traffic? 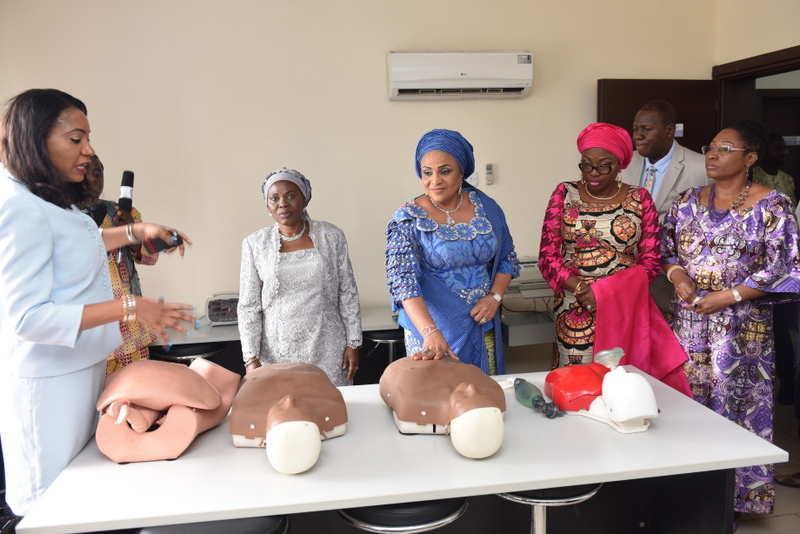 Lagos State Governor, Mr. Akinwunmi Ambode (3rd left); his wife & Chairman, Committee of Wives of Lagos State Officials (COWLSO), Bolanle (2nd left); Deputy Governor of Lagos State, Dr. Mrs. Oluranti Adebule (left); Edo State Governor, Comrade Adams Oshiomhole (middle); Sir Adebukunola Adebutu Kessington (3rd right) with the Certificate of Appreciation by COWLSO; Kebbi State Governor, Alhaji Atiku Bagudu and Speaker, Lagos State House of Assembly, Rt. Hon. Mudashiru Obasa during the closing ceremony of the 16th Annual National Women Conference organized by COWLSO, at the Convention Centre, Eko Hotel & Suites on Wednesday, October 26, 2016. He said the interventions of the Governor was not only reducing traffic and fuel consumption, but was also bringing back the good times of family bonding as travel time has reduced, hence husbands and wives don’t have excuse of traffic to get home late or leave very early. 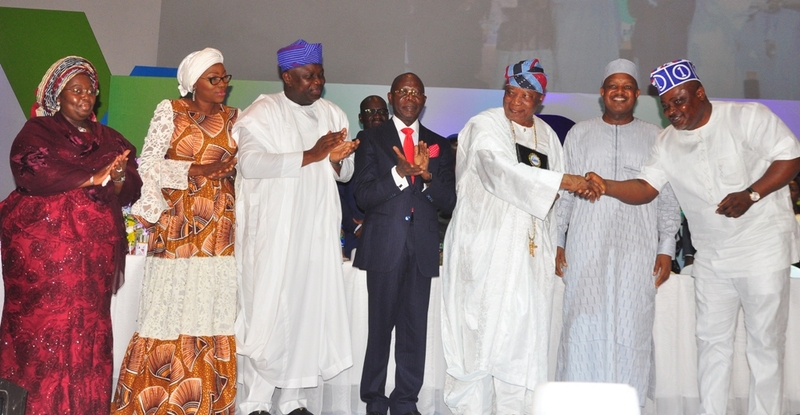 Lagos State Governor, Mr. Akinwunmi Ambode (4th left), with Kebbi State Governor, Alhaji Atiku Bagudu (4th right), presenting Certificate of Appreciation to Senior Special Assistant to the President on Millennium Development Goals, Mrs. Adejoke Adefulire (3rd right) during the closing ceremony of the 16th Annual National Women Conference organized by COWLSO, at the Convention Centre, Eko Hotel & Suites on Wednesday, October 26, 2016. With them are Edo State Governor, Comrade Adams Oshiomhole (left); his wife, Iara (2nd left); Wife of Lagos State Governor & Chairman, Committee of Wives of Lagos State Officials (COWLSO), Mrs. Bolanle Ambode (3rd left); Wife of Kebbi State Governor, Dr. Zainab Bagudu (2nd right) and Deputy Governor of Lagos State, Dr. Mrs. Oluranti Adebule. Oshiomhole said over the years as Governor of Edo State, he has had cause to learn and borrow from the template Lagos was running, expressing optimism that his successor and Governor-elect, Mr. Godwin Obaseki, would be willing to borrow a leaf from the COWLSO Conference as well as the traffic management strategy of Lagos. “We borrowed what is happening in Lagos to make the case for Godwin Obaseki in Edo that Nigeria must move away from a tradition in which you have to be a celebrated politician to become eligible to contest for a political office, and that what we need in times like this are skills and people with managerial acumen and competence and we readily referred to Lagos as an example of what works with a seasoned and indisputable leader like Asiwaju Bola Ahmed Tinubu laying the foundation, dreaming big, dreaming clearly and setting the vision and identifying capable young men and women to translate those vision in a manner that is unprecedented in the history of our country,” Oshiomhole said. 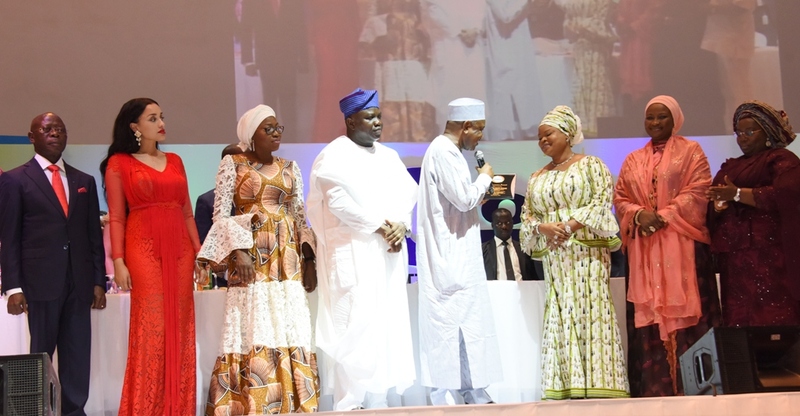 Lagos State Governor, Mr. Akinwunmi Ambode (3rd left); his wife & Chairman, Committee of Wives of Lagos State Officials (COWLSO), Bolanle (left); Edo State Governor, Comrade Adams Oshiomhole (4th left); presenting Certificate of Appreciation to APC Women Leader, South West, Chief Mrs. Kemi Nelson (4th right) during the closing ceremony of the 16th Annual National Women Conference organized by COWLSO, at the Convention Centre, Eko Hotel & Suites on Wednesday, October 26, 2016. 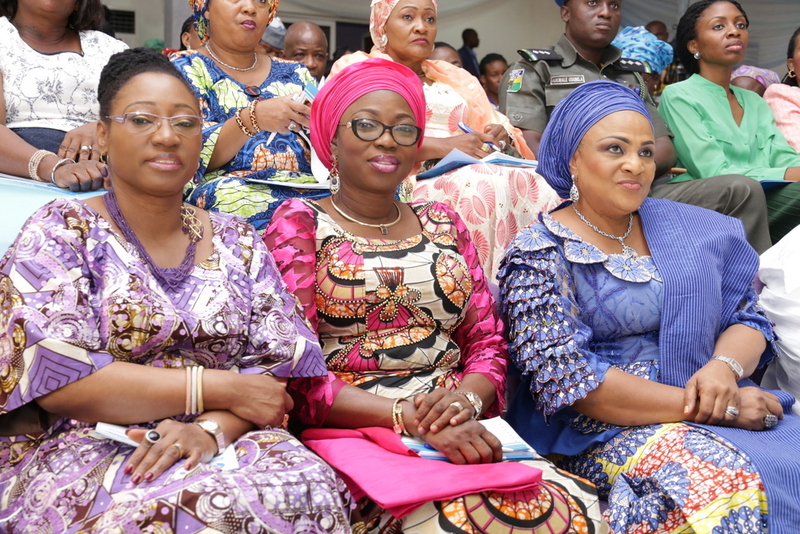 (L-R) With them are Deputy Governor of Lagos State, Dr. Mrs. Oluranti Adebule; Wife of Edo State Governor, Mrs. Iara Oshiomhole; Speaker, Lagos State House of Assembly, Rt. Hon. Mudashiru Obasa and Kebbi State Governor, Alhaji Atiku Bagudu. 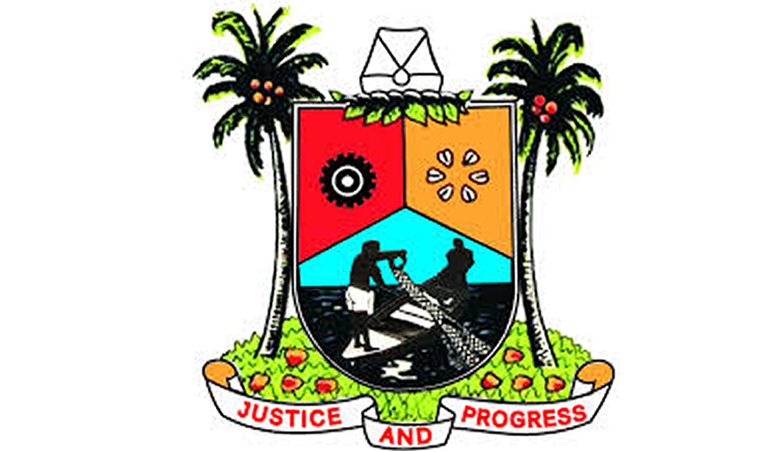 He added that with the achievements of Governor Ambode, so far, he (the Governor) has shown that the only poverty to address is the poverty of ideas, adding that once the brain is creative and imaginative with a Governor that is ready to apply himself, there is no problem that would defer solution. “You have shown that our task as leaders is not to lament what does not work but to think through how to make it work and that you are doing; that you have done and I know that you will continue to do,” Oshiomhole said. Earlier in her remarks, wife of the Governor of Lagos State, Mrs. Bolanle Ambode said the three-day conference had opened the mind of participants to new ideas, information and statistics, saying that the women are better empowered to become change agents. Lagos State Governor, Mr. Akinwunmi Ambode (3rd left); his wife & Chairman, Committee of Wives of Lagos State Officials (COWLSO), Bolanle (3rd right); Edo State Governor, Comrade Adams Oshiomhole (right); his wife , Iara (2nd right); Kebbi State Governor, Alhaji Atiku Bagudu (left) and his wife; Dr. Zainab(2nd left) during the closing ceremony of the 16th Annual National Women Conference organized by COWLSO, at the Convention Centre, Eko Hotel & Suites on Wednesday, October 26, 2016. She explained that the success story of the conference could not have been without the excellent cooperation of the women who form COWLSO, just as she admonished them to put all what they were taught at the conference into use in their respective offices and homes. 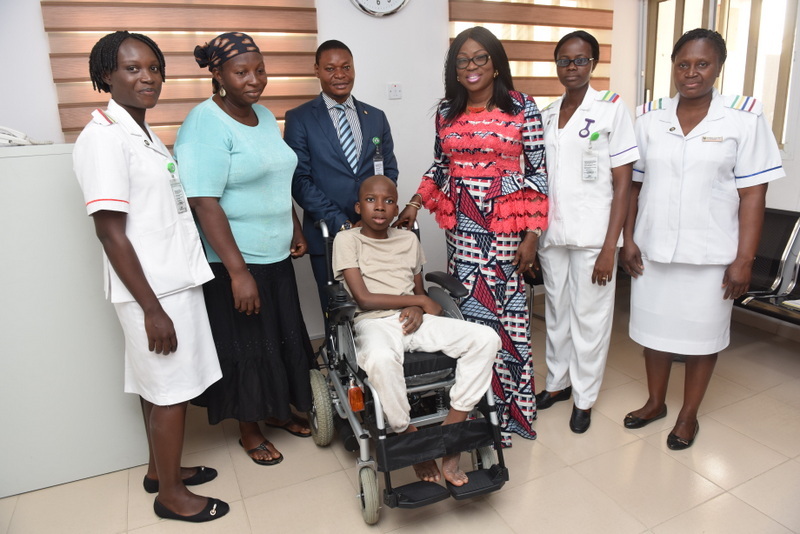 The wife of the Governor of Lagos State, Mrs. Bolanle Ambode, has called on young girls to imbibe the winning attitude by believing in themselves, their ability to succeed and to avoid teenage pregnancy. 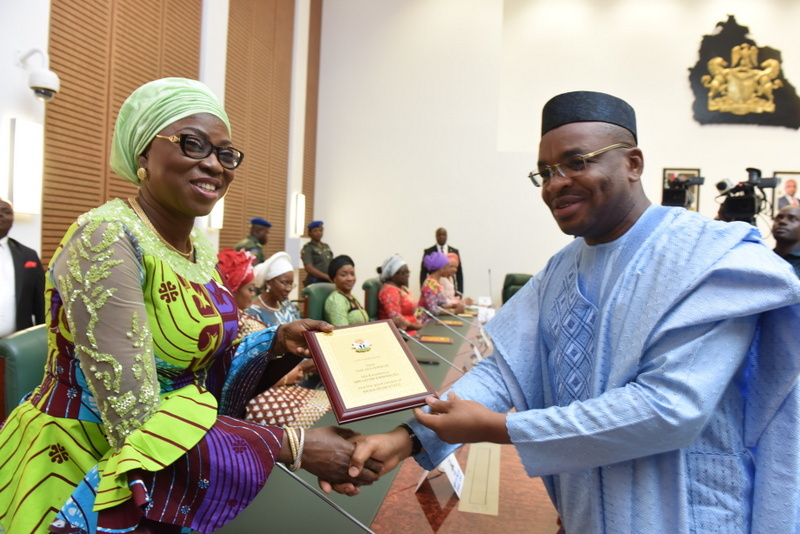 Wife of Lagos State Governor, Mrs. Bolanle Ambode (left); receiving a plaque from Akwa Ibom State Governor, Mr. Emmanuel Udom during the SGWF quarterly meeting and courtesy visit to the Governor of Akwa Ibom, on Wednesday, October 12, 2016. Mrs. Ambode made this call during the quarterly meeting of the Southern Governors’ Wives Forum (SGWF), while addressing female students in Uyo, Akwa-Ibom state. Mrs. Bolanle Ambode noted that the best guarantee for a great future was through education, self – discipline and determination. 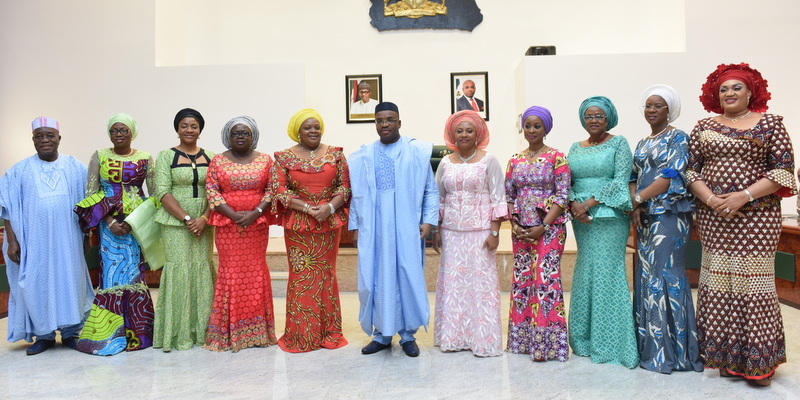 Akwa Ibom State Governor, Mr. Emmanuel Udom (middle), his Wife, Deaconess Martha (5th right); Chairman, Southern Governors’ Wives Forum (SGWF), Mrs. Nkechi Okorocha (5th left); Wife of Lagos State Governor, Mrs. Bolanle Ambode (2nd left); Deputy Governor of Akwa Ibom State, Mr. Moses Ekpo (left) and other members of SGWF during the SGWF quarterly meeting and courtesy visit to the Governor of Akwa Ibom, on Wednesday, October 12, 2016. 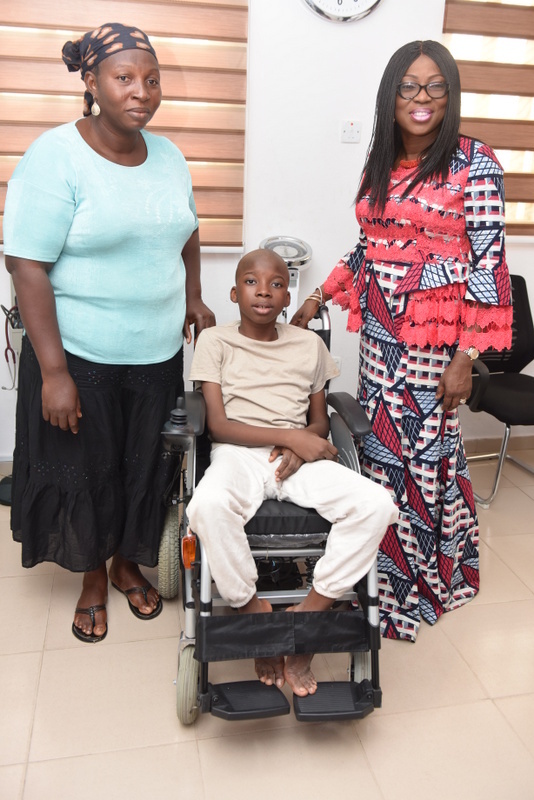 Speaking further, the wife of Lagos State Governor, Mrs. Ambode advised the young girls, whom she referred to as the pride of womanhood, and the next generation of mothers and leaders in our country, to refrain from all anti – social activities that could negatively impact their dreams and aspirations. 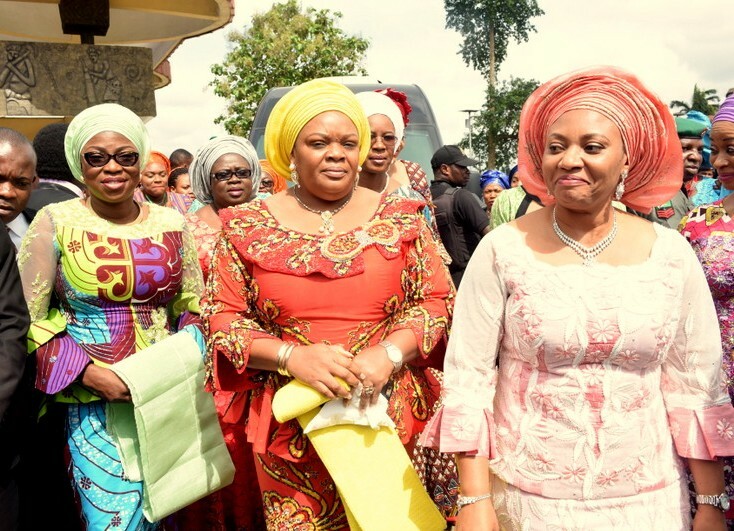 Wife of Lagos State Governor, Mrs. Bolanle Ambode; Wife of Imo State Governor & Chairman, Southern Governors’ Wives Forum (SGWF), Mrs. Nkechi Okorocha and Wife of Akwa Ibom State Governor, Deaconess Martha Udom during the SGWF quarterly meeting in Akwa Ibom, on Wednesday, October 12, 2016. Emir of Gwandu, HRH. 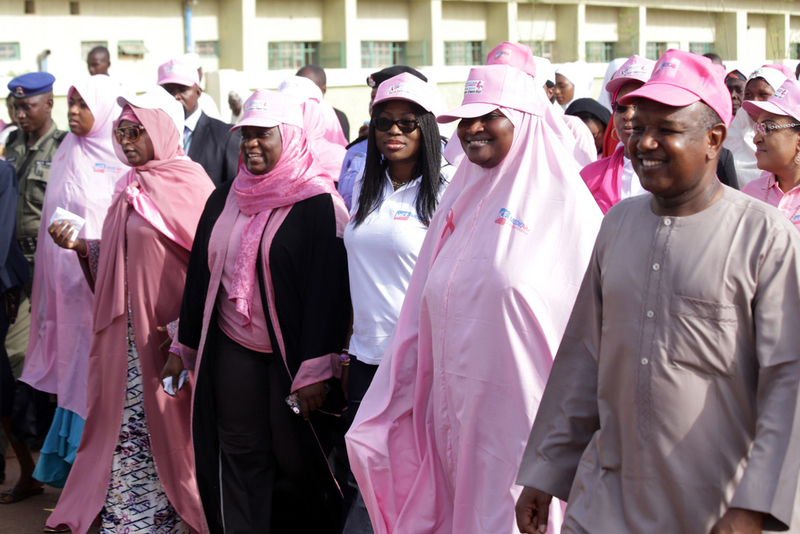 Alhaji Muhammadu Iliyasu Bashar (3rd left); Wife of Lagos State Governor, Mrs. Bolanle Ambode (2nd right); wife of the governor of Kebbi State and founder, Medicaid Cancer Foundation, Dr. Zainab Atiku Bagudu (left); wife of the Governor of Kogi State, Hajiya Rashida Bello (2nd left); wife of the Governor of Niger State, Hajiya Amina Bello (3rd right); and wife of the Governor of Cross River, Dr. Linda Ayade (right), during the “Walk Away Cancer” campaign at the Emir’s Palace, as part of 2016 Kebbi Cancer Awareness Week, organized by Medicaid Cancer Foundation, a pet project of the wife of the Governor, at Birni-Kebbi, Kebbi State, on Friday, 7th October, 2016. 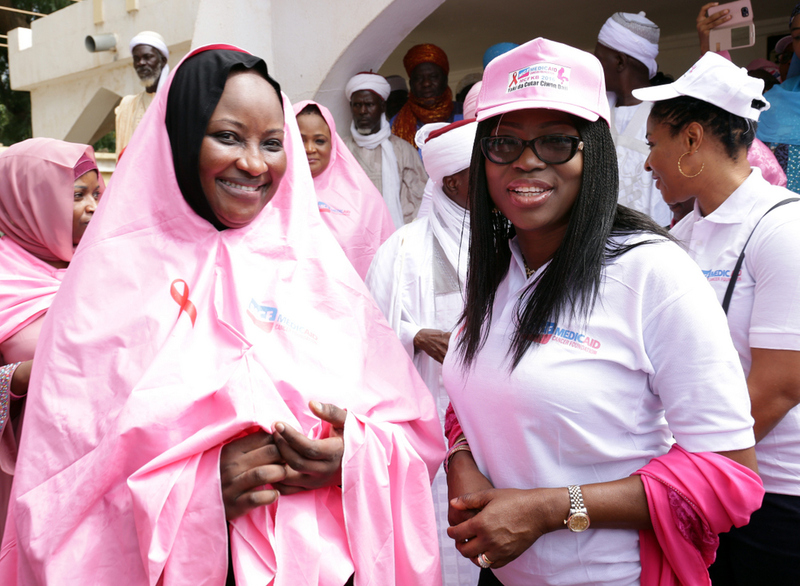 Wife of Lagos State Governor, Mrs. Bolanle Ambode (right) and wife of the governor of Kebbi State & founder, Medicaid Cancer Foundation, Dr. Zainab Atiku Bagudu (left), during the “Walk Away Cancer” campaign at the Palace of the Emir of Gwandu, as part of 2016 Kebbi Cancer Awareness Week, organized by Medicaid Cancer Foundation, a pet project of the wife of the Governor, at Birni-Kebbi, Kebbi State, on Friday, 7th October, 2016. 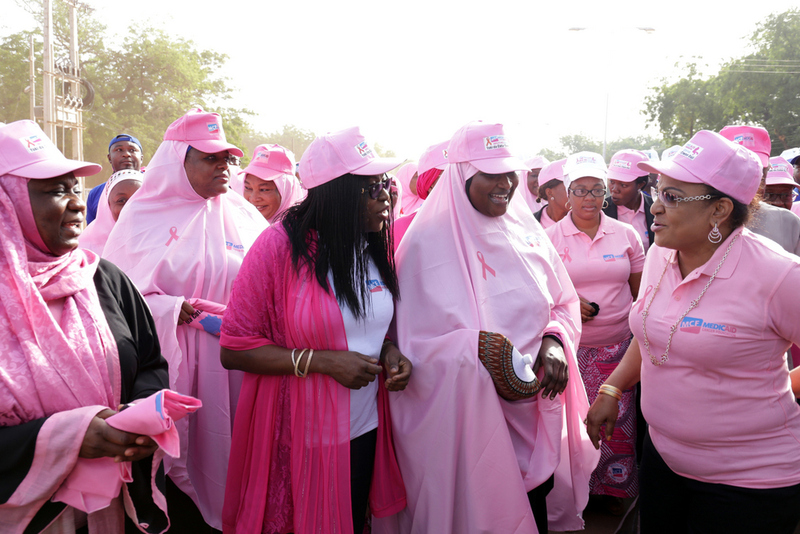 Wife of Lagos State Governor, Mrs. Bolanle Ambode (2nd left); wife of the governor of Kebbi State and founder, Medicaid Cancer Foundation, Dr. Zainab Atiku Bagudu (right); wife of the Governor of Oyo State, Mrs. Florence Ajimobi (2nd right); wife of the Governor of Kogi State, Hajiya Rashida Bello (m); and wife of the Governor of Sokoto State, Hajiya Maryam Mairo Tambuwal (left), during the 2016 Kebbi Cancer Awareness Week, organized by Medicaid Cancer Foundation, a pet project of the wife of the Governor, at Birni-Kebbi, Kebbi State, on Thursday, 6th October, 2016. 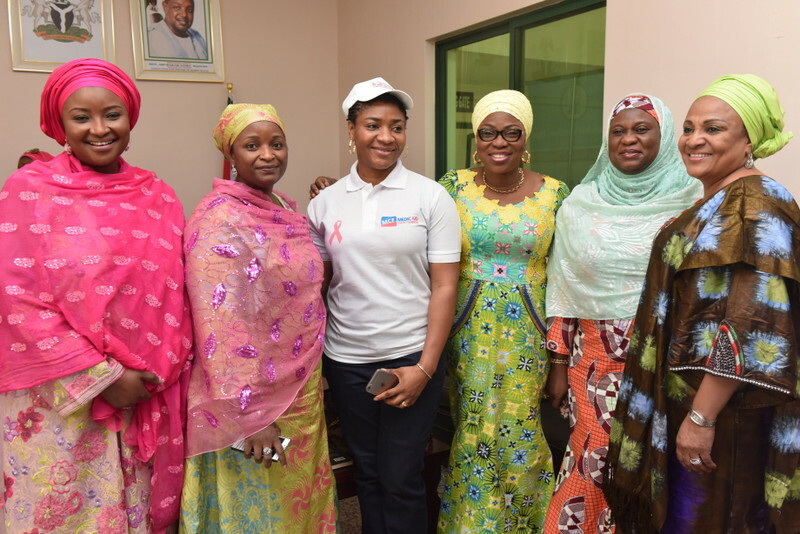 Wife of Lagos State Governor, Mrs. Bolanle Ambode (2nd right); wife of the governor of Kebbi State and founder, Medicaid Cancer Foundation, Dr. Zainab Atiku Bagudu (right); wife of the Governor of Nasarawa State, Hajiya Mairo Al-Makura (2nd left); and wife of the Governor of Niger State, Hajiya Amina Bello, at the “Cancer Awareness & Fundraising Event” of the 2016 Kebbi Cancer Awareness Week, organized by Medicaid Cancer Foundation, a pet project of the wife of the Governor, at Birni-Kebbi, Kebbi State, on Thursday, 6th October, 2016. 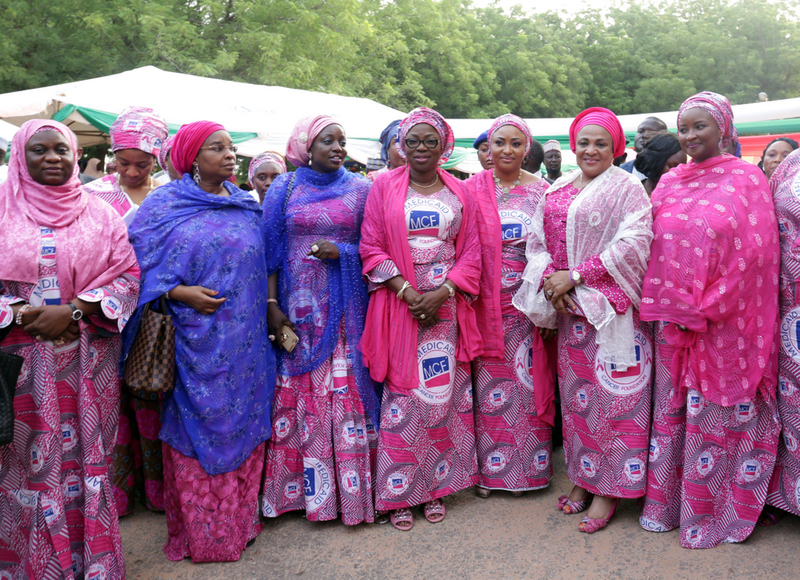 Wife of Lagos State Governor, Mrs. Bolanle Ambode (4th right); wife of the governor of Kebbi State and founder, Medicaid Cancer Foundation, Dr. Zainab Atiku Bagudu (right); wife of the Governor of Oyo State, Mrs. Florence Ajimobi (2nd right); wife of the Governor of Kogi State, Hajiya Rashida Bello (3rd right); wife of the Governor of Sokoto State, Hajiya Maryam Mairo Tambuwal (4th left); wife of the Governor of Nasarawa State, Hajiya Mairo Al-Makura (3rd left); wife of the Governor of Cross River State, Dr. Linda Ayade (2nd left); and wife of the Governor of Niger State, Hajiya Amina Bello, during the 2016 Kebbi Cancer Awareness Week, organized by Medicaid Cancer Foundation, a pet project of the wife of the Governor, at Birni-Kebbi, Kebbi State, on Thursday, 6th October, 2016. 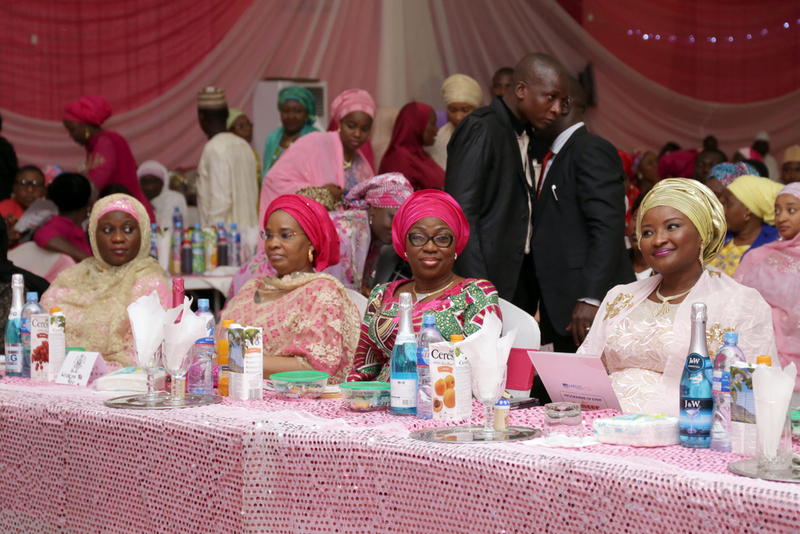 Wife of Lagos State Governor, Mrs. Bolanle Ambode (3rd right); wife of the governor of Kebbi State and founder, Medicaid Cancer Foundation, Dr. Zainab Atiku Bagudu (left); wife of the Governor of Niger State, Hajiya Amina Bello (2nd right); wife of the Governor of Oyo State, Mrs. Florence Ajimobi (right); wife of the Governor of Cross River State, Dr. Linda Ayade (3rd left); and wife of the Governor of Zamfara State, Hajiya Hadiza Abdulaziz Yari (2nd left), during the 2016 Kebbi Cancer Awareness Week, organized by Medicaid Cancer Foundation, a pet project of the wife of the Governor, at Birni-Kebbi, Kebbi State, on Friday, 6th October, 2016. 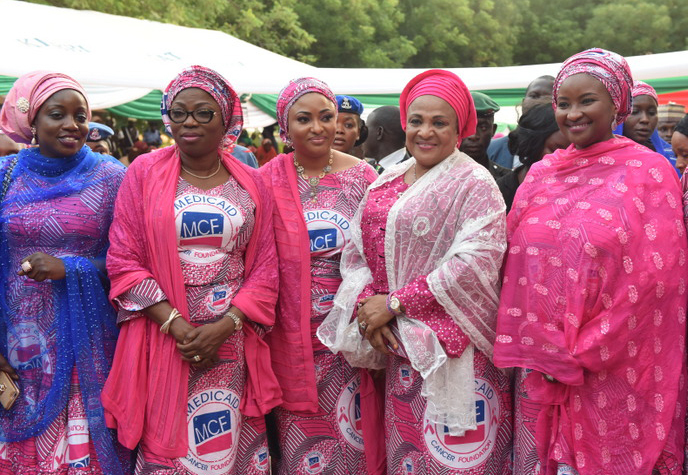 Wife of Lagos State Governor, Mrs. Bolanle Ambode (2nd left); wife of the governor of Kebbi State and founder, Medicaid Cancer Foundation, Dr. Zainab Atiku Bagudu (2nd right); wife of the Governor of Oyo State, Mrs. Florence Ajimobi (r); and wife of the Governor of Niger State, Hajiya Amina Bello (L), during the “Walk Away Cancer” campaign as part of 2016 Kebbi Cancer Awareness Week, organized by Medicaid Cancer Foundation, a pet project of the wife of the Governor, at Birni-Kebbi, Kebbi State, on Friday, 7th October, 2016. 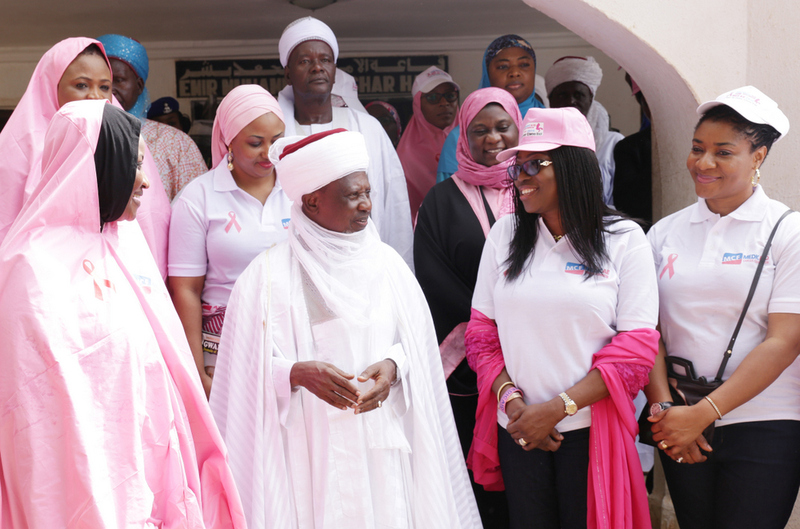 Governor of Kebbi State, Senator Abubakar Bagudu (right), his wife and founder, Medicaid Cancer Foundation, Dr. Zainab (2nd right); Wife of Lagos State Governor, Mrs. Bolanle Ambode (m); wife of the Governor of Niger State, Hajiya Amina Bello and Hajiya Hadiza Abdulaziz Yari, during the “Walk Away Cancer” campaign as part of 2016 Kebbi Cancer Awareness Week, organized by Medicaid Cancer Foundation, a pet project of the wife of the Governor, at Birni-Kebbi, Kebbi State, on Friday, 7th October, 2016. Emir of Gwandu, HRH. 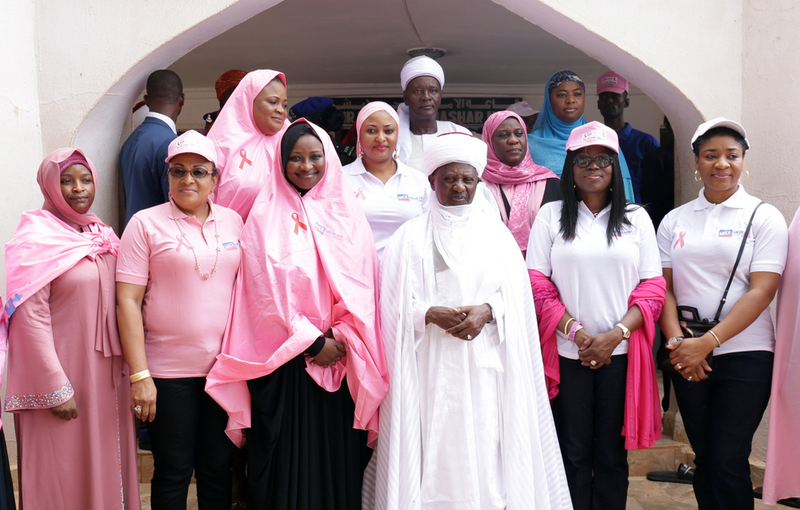 Alhaji Muhammadu Iliyasu Bashar (4th right); Wife of Lagos State Governor, Mrs. Bolanle Ambode (2nd right); wife of the governor of Kebbi State and founder, Medicaid Cancer Foundation, Dr. Zainab Atiku Bagudu (3rd left); wife of the Governor of Oyo State, Mrs. Florence Ajimobi (2nd left); wife of the Governor of Kogi State, Hajiya Rashida Bello (4th left); wife of the Governor of Zamfara State, Hajiya Hadiza Abdulaziz Yari (L); wife of the Governor of Niger State, Hajiya Amina Bello (3rd right); and wife of the Governor of Cross River, Dr. Linda Ayade (r), during the “Walk Away Cancer” campaign at the Emir’s Palace, as part of 2016 Kebbi Cancer Awareness Week, organized by Medicaid Cancer Foundation, a pet project of the wife of the Governor, at Birni-Kebbi, Kebbi State, on Friday, 7th October, 2016. Emir of Gwandu, HRH. 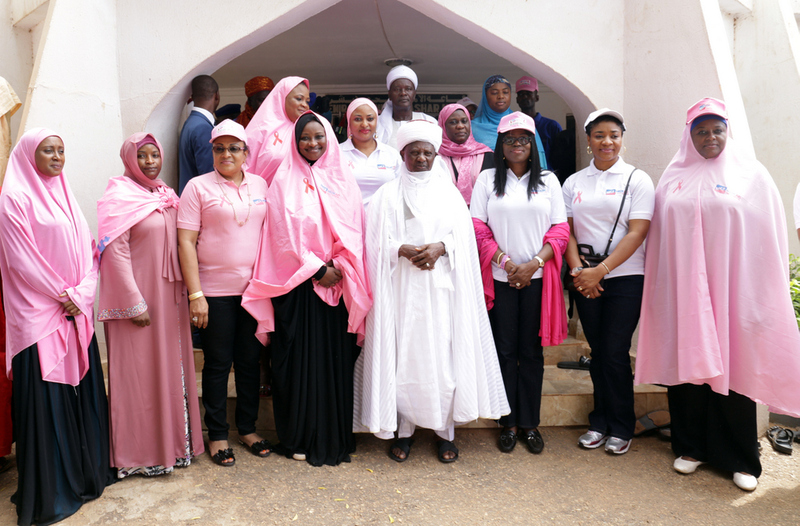 Alhaji Muhammadu Iliyasu Bashar (5th right); Wife of Lagos State Governor, Mrs. Bolanle Ambode (3rd right); wife of the governor of Kebbi State and founder, Medicaid Cancer Foundation, Dr. Zainab Atiku Bagudu (4th left); wife of the Governor of Oyo State, Mrs. Florence Ajimobi (3rd left); wife of the Governor of Kogi State, Hajiya Rashida Bello (5th left); wife of the Governor of Zamfara State, Hajiya Hadiza Abdulaziz Yari (2nd left); wife of the Governor of Niger State, Hajiya Amina Bello (4th right); and wife of the Governor of Cross River, Dr. Linda Ayade (2nd right), during the “Walk Away Cancer” campaign at the Emir’s Palace, as part of 2016 Kebbi Cancer Awareness Week, organized by Medicaid Cancer Foundation, a pet project of the wife of the Governor, at Birni-Kebbi, Kebbi State, on Friday, 7th October, 2016. 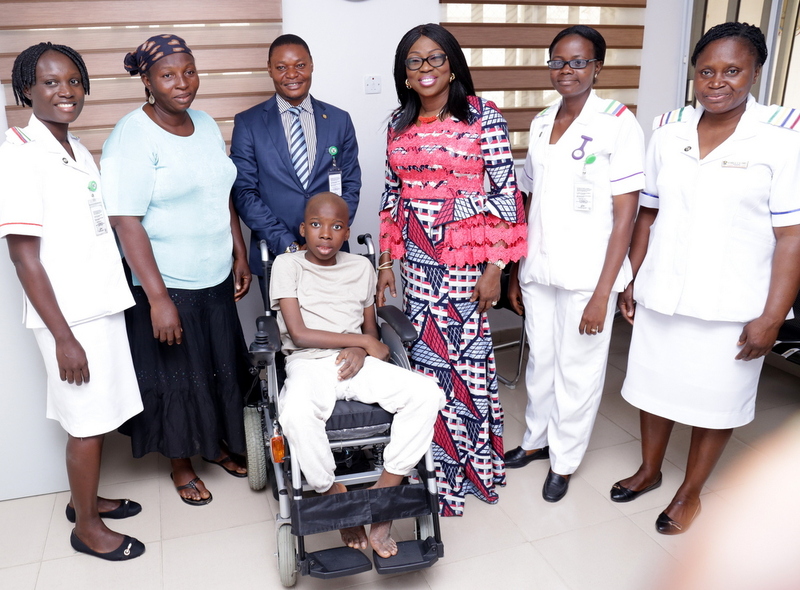 Wife of the Governor of Lagos State, Mrs. Bolanle Ambode has called for continuous awareness and enlightenment on cervical cancer to curtail the scourge among people, especially women. She disclosed that cancer in its various forms and manifestation is a major enemy of mankind, as it has claimed millions of lives across the world. Bolanle made this disclosure at the medical symposium with the theme: “The Role of HPV Testing in Cervical Cancer Screening in Nigeria”, on Friday. 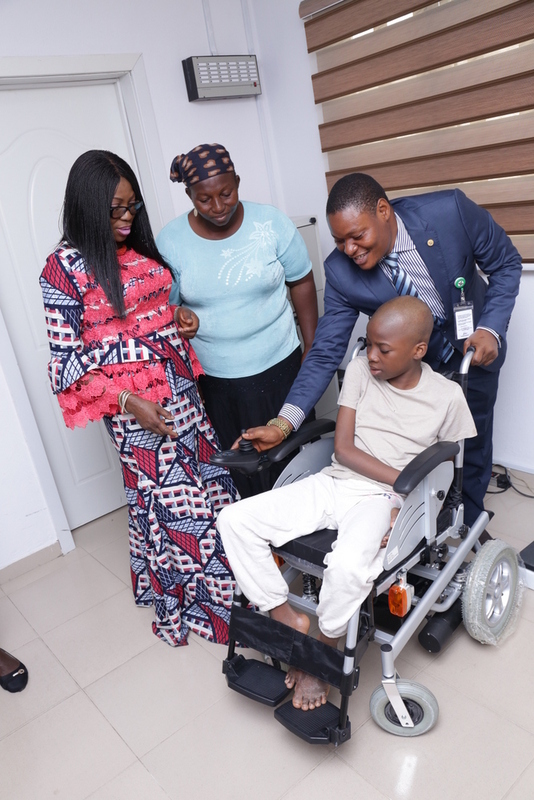 The symposium was organized by Access to Basic Medical Care Foundation, an NGO of the wife of the governor of Oyo State, Mrs. Florence Ajimobi, at the Mauve centre, Ibadan, Oyo State. She urged all especially women to go for regular screening, as early detection of it can be treated and cured like any other health condition.